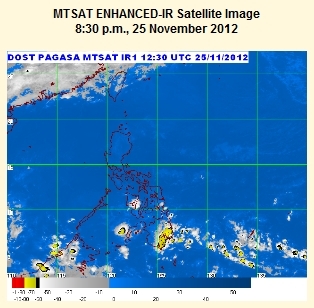 Ridge of a high pressure area extending across Luzon. The whole country will be partly coudy with isolated brief rainshowers or thunderstorms mostly in the afternoon or evening. Moderate to strong winds blowing from the Northeast to East will prevail over the Eastern sections of Luzon and Visayas and the coastal waters along these areas will be moderate to rough. Elsewhere, winds will be light to moderate coming from the northeast to east with slight to moderate seas.